MamyPoko Pure & Soft baby wipes are suitable for new born babies. It has purified water for cleaning baby's bottom safely. 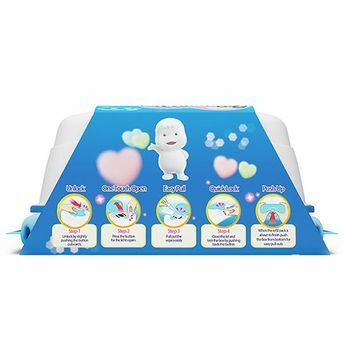 The pop box makes it very easy to use and it is also refillable with MamyPoko Pure & Soft baby wipes . Its cottony soft sheet is thicker which help the wipe to hold extra moisture. A mild fragrance gives the feeling of freshness to new born. Additional Information: Blessing the Growth of Children. Gratitude for Their Beaming Smiles - is the motto behind MamyPoko brand. MamyPoko Pants is a Pant Style Diaper brand from Unicharm. A multi-national company with 30 years of experience in baby and child care, the brand ensures absolute protection and comfort during your baby's diaper days so that he/ she can grow up happy and healthy. Explore the entire range of Cotton Buds, Balls & Wipes available on Nykaa. Shop more MamyPoko products here.You can browse through the complete world of MamyPoko Cotton Buds, Balls & Wipes .